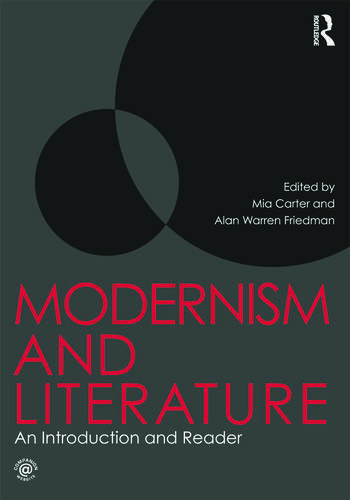 This volume offers a comprehensive representation of the exciting, pivotal, and urgent nature of literary Modernism, as well as more recent approaches including the "global turn." Modernism can be difficult to understand without an awareness of contemporary concerns, so Mia Carter and Alan Friedman incorporate texts from a wide variety of disciplines such as art, politics, science, medicine, and philosophy. A companion website (www.routledge.com/cw/carter) featuring an interactive timeline with dates and images that contextualise the literature of the period, as well as author biographies and links to additional resources and videos. Addressing current as well as historical debates about Modernism, this book includes discussion of the Harlem Renaissance, feminism and women’s writing, international and global movements and anti-imperialism, while acknowledging the variety of competing modernisms. This is the ideal guide for anyone seeking an overview and an in-depth treatment of this complex cultural turn and its foundational texts. Mia Carter is a University Distinguished Teaching Associate Professor of Literature at the University of Texas at Austin; she was recognized as a University of Texas System Regents' Outstanding Teacher in 2010. Her fields of specialization are Modern Studies, Imperial and Postcolonial Studies, Cinema and Cultural Studies. Carter is co-editor (with Barbara Harlow) of Archives of Empire (Duke UP) and Orientalism and Imperialism: A Documentary Sourcebook (Basil Blackwell). Her articles have appeared in numerous anthologies and journals, including English Language Notes, Signs, Studies in European Cinema, and ALIF: Journal of Comparative Poetics. Her current work in progress is Virginia Woolf, History's Child: Heritage and Imagination. Thaman Professor of English and Comparative Literature at the University of Texas, Austin, Alan Friedman has also taught at universities in England, France, and Ireland. His five authored books include Fictional Death and The Modernist Enterprise, Party Pieces: Oral Storytelling and Social Performance in Joyce and Beckett, and Multivalence: The Moral Quality of Form in the Modern Novel, and monographs on Lawrence Durrell and William Faulkner. His ten edited books and journals include compilations on Durrell, Beckett, Joyce, and Mario Vargas Llosa, plus Situating College English: Lessons from an American University. He has chaired UT’s Faculty Council and received its Civitatis Award for "dedicated and meritorious service."